Pop Open a Christmas Cracker! 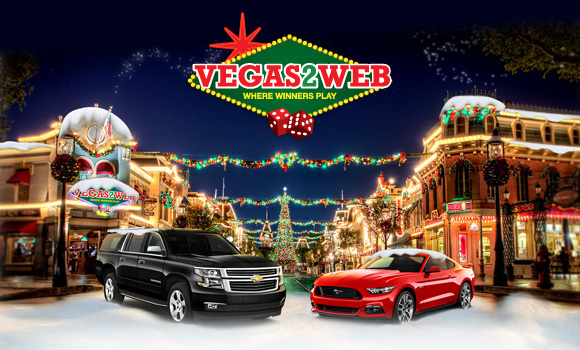 Vegas2Web Christmas Promotion 2015! Vegas2Web’s talented team have been hard at work putting together a BIG Christmas Giveaway for their players! Once the Christmas Cracker is popped open it will reveal a present inside. Players will be rewarded with Free Spins, Match Bonuses, Comp Points and Free Chips! •A Chevrolet Suburban + USD10,000 cash prize to the player in the top spot of the leaderboard by 23 December 2015. •A Ford Mustang – players in the top 30 of the leaderboard by Christmas Eve will be entered into a lucky draw to win this special prize! All new Players that sign up between 30 November and 23 December 2015 will also receive one free entry into the Christmas Eve lucky draw! Get the word out to your friends and neighbors. Let them know that both new and existing players stand a chance to win the Chevrolet Suburban or the Ford Mustang, or both! NEW Rival Slot Game Released! Rival have added a new 25 line, 5 reel, i-Slot to their collection of games! 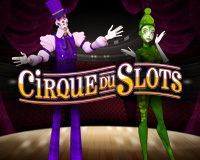 From November, players can look forward to acrobatic feats in Cirque du Slots based on the widely popular Cirque du Soleil. The game is divided into 3 Acts for you to progress through, creating a fantastic story element to the game. Account managers are standing by to help you make this a memorable Christmas, so get in touch with them today for unique Christmas specials and new game offers. From our Vegas2Web Casino Review page! Vegas2Web Casino offers Gambling Gurus visitors an exclusive welcome offer! Offer includes a $10 Free No-Deposit Welcome Bonus plus a 1st Deposit Bonus of 150% up to $100! To see these codes and all of our exclusive bonus codes visit our landing page here. $10 Free No-Deposit Welcome Bonus! Use Bonus Code: No Code Needed – Offer will be in casino cashier upon registering through one of our links here. *Wagering Requirements: 35x Bonus | *Maximum Withdrawal: $200 . *Allowed games: Slot Games Only. 1st Deposit Bonus: Exclusive 150% Match Bonus up to $100 Plus another $15 Free Spins Bonus after first deposit! *Maximum Cash-Out: No maximum Cash Out. *Allowed games: All games, except DoubleUp, GameSet, Slot Progressive. As a regular member of Vegas2Web Casino, you can claim Daily Casino Bonuses in the cashier!